In celebration of their upcoming wedding, The Young and the Restless stars Sharon Case and Joshua Morrow took a trip down memory lane for Sharon and Nick. Meanwhile, Morrow had plenty of comments about his style from those early days in the 1990s. He even mentioned that he thought his sweater had come from his grandma’s curtains. Then, the on-screen couple looked back at their first wedding in 1996. They looked so incredibly young, and Case noted she thought that their upcoming wedding would make three for them, and everybody knows what they say about the third time — it’s the charm, or so Y&R fans hope. Even so, a few fans admitted that while they adored a young version of this couple, they simply don’t see the same chemistry from them now that they’re older. 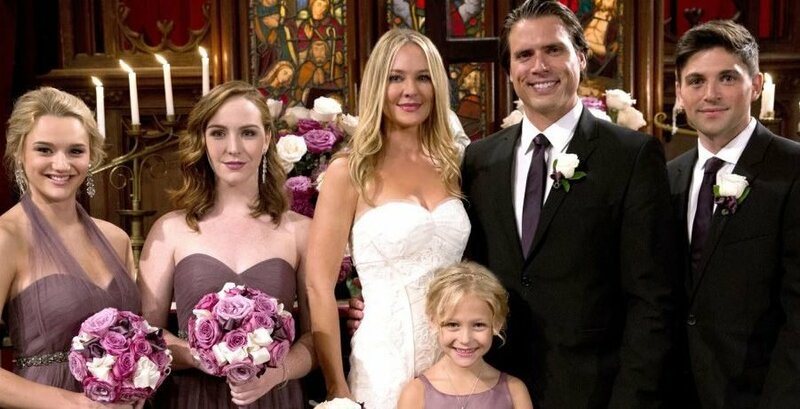 These fans wish that “Shick” would remain friends instead of walking down the aisle again. Then, a dramatic scene when the pair jumped out of an airplane scared Case. After that, they saw the hospital scenes from when their son, Noah, was born. During that scene, Nick brought up Grace, and both actors looked a bit sheepish at that because they know that Nick cheated on Sharon more than once with Grace. However, nothing moved them more than looking back at the tragic death of their daughter Cassie Newman (Camryn Grimes). Both Morrow and Case got emotional seeing that intense scene in the moments after Cassie died of her injuries from a car wreck. They noted that part of their sadness in those moments drew from the fact that they knew they’d no longer be working with Grimes. Finally, the last moment they looked at was their second wedding where a newly awakened Phyllis (Gina Tognoni) showed up to crash it, and much like Sharon, Phyllis also wore white. Somewhat ironically, it could be Phyllis who messes up the upcoming third “Shick” wedding, according to Inquisitr‘s Y&R spoilers. ‘The Young And The Restless’ Spoilers For Wednesday, August 8: Nikki Goes Too Far With Sharon Over Nick! ‘The Young And The Restless’ Spoilers For Friday, August 17: Rey Arrives And Summer Takes Nick’s Money! ‘The Young And The Restless’ Recap For Thursday, August 16: Summer Takes Nick’s Bribe! ‘The Young And The Restless’ Recap For Monday, August 20: Nick Reveals He’s Billy’s Landlord! ‘The Young And The Restless’ Spoilers For Wednesday, August 22: Kyle Shocks Phyllis With Summer’s Plans! ‘The Young And The Restless’ Recap For Thursday, September 6: Billy Tells Phyllis His Little Secret!